There are two Mathematics-based sections on the ASVAB that those planning to take the ASVAB struggle with the most. The first being the Arithmetic Reasoning Section and the second is the Mathematics Knowledge Section. Both of these sections test different things. The Arithmetic Reasoning section focuses on word problems. It tests you on basic math, percentages, ratios and algebraic equations. Finding averages and specific numbers based on average and other numbers are also found on the test. To do well on this you must know the different terminology referring to math functions such as “difference” means subtraction, “sum” means addition, “double” means multiply by 2, “less than” means subtract, “more than” means add, “of” means multiply, “product” means multiply, and “quotient” means divide. Since this section is written in paragraph format make sure to read carefully and underline important details that help you convert the words to math. The Mathematics Knowledge section focuses on basic math questions, percentages, fractions, and pre-algebra. These questions are not word problems instead they are mainly written using mathematical symbols taught in schools. There is also some geometry on it. Please know the formulas for Area for square, rectangle, circle and triangle. You also need to know the Pythagorean Theorem that is used to find the missing sides of the triangle. Know how to set up proportions. Study up on adding, subtracting, multiplying and dividing fractions. Also learn how to convert fractions to decimals and percentages. It is important that you know how to change mixed fractions to improper fractions. Remember how to work with exponents and square roots. Follow the order or operations because it comes up several times on the test. In terms of algebra, you are looking for the variable “finding x”. I hope this article helps you in studying some of the major topics in the Math-based sections of the ASVAB. Most people need help reviewing the math portions of the ASVAB because it’s been a while for some people. Please feel free to contact Phoenix Tutoring & Test Prep for ASVAB tutoring and test preparations. 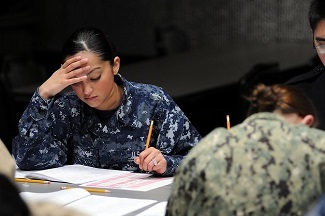 We provide comprehensive test preparation for the ASVAB. You can contact us at 773-386-3184. You can also visit www.phxtutoring.com for more information. We provide in-person one-on-one tutoring for ASVAB all over Phoenix, Chandler, Tempe, Mesa, Gilbert, Scottsdale, and surrounding areas. We also offer one-on-one online ASVAB tutoring all over United States using Skype. Our sessions are individually tailored towards your needs.